2017 calendar featuring all new illustrations! 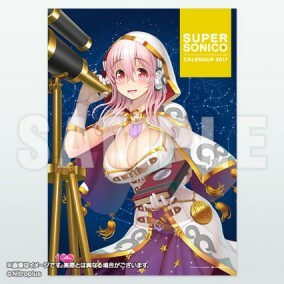 A 2017 calendar featuring illustrations of Sonico dressed up as the 12 zodiac signs, from the "Sonicolumn" that ran in "Monthly Hobby Japan!" Tsuji Santa has reworked the illustrations featured in the column into full-body portraits, significantly adding and improving. And the cover is of course a Tsuji Santa original as well! Spend your 2017 together with Sonico! * Calendar runs from January to December 2017. Limited to a purchase of 1 units per person.